The extremely mild winter we've been having was rudely interrupted by a nasty cold front that finally pushed the water temps into the 60s. It's not supposed to last long but up until now we have enjoyed an outstanding month of January with most of our inshore fish still in a fall pattern. 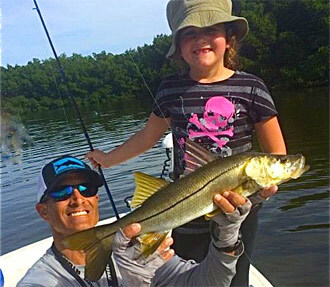 This means we've still been using scaled sardines and finding plenty of snook. They've just been just fattening up for several weeks for a winter that may, or may not, come. 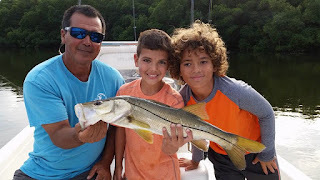 Luckily for us this means we've had some great snook bites, particularly later in the afternoons and on the better tides. The redfish schools are roaming around as well and we have been fortunate to find some nice slot sized fish for folks to invite home for dinner. We've had good success throwing soft plastics at these bruisers. When they are foraging in the grass my favorite bait is a Rootbeer colored DOA C.A.L. with a chartreuse tail. 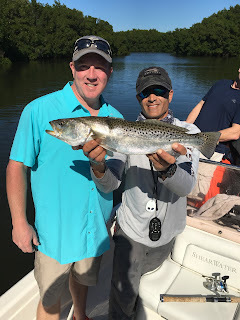 After kind of a down year for trout in the middle part of the bay, this year we have seen some very nice fish that have moved into the deeper holes and canals. Last week we had several fish over 20" and I suspect we'll continue to see an influx of larger fish as the water cools. Soft plastics are great for these fish as well. We are finally seeing some larger sheepshead moving in too. These notorious bait stealers are delicious and many folks like to get a few in the box. There has also been some great rod bending action with plenty of acrobatic ladyfish, hard fighting jacks and feisty little sharks to keep even the most rambunctious child busy. Right now the water is crystal clear and the wildlife very abundant. There are manatees and dolphins along with herons, osprey and pelicans all around as we enjoy some outstanding fishing and weather. Don't be left out in the cold!! Come enjoy another fabulous FL winter and bring a kid or two with you! !